Compared to the cold, surgical steel of the irons, the woods are the chunkier, if you forgive the pun, more clubbable occupants of the golfer's bag. But when called in to action, there's nothing half-hearted about what they delivery. These boys can pack a real punch, offering extended yardage down the fairway to experienced practitioners. As with the irons they are numbered in terms of distance capability and the amount of loft offered by the angle of the club face. Similarly, the length of the shaft decreases by half an inch in length up the ranks. So, for example, a two-wood can hit approximately 220 yards, has a 16 degree loft and shaft length of 42.5 inches, whereas the equivalent numbers for its close companion, the three, are, respectively: 200: 20: 42. One other basic point to take note of is that they are no longer made from the material, wood, from which their name derives. Today's generation of woods are usually manufactured from either steel or titanium alloy, which are lighter and also more practical in terms of care and maintenance. The star of the wood family is undoubtedly the number one, more commonly referred to as the driver. Its role is to provide maximum length of shot off the tee, and it packs an impressive punch. However, harnessing this power requires a seasoned hand, and many an inexperienced player has come to grief in the belief they are up to controlling this beast, only to find it doesn't respond kindly to being taken for granted. Those who err on the side of caution will wisely forgo the driver off the tee in favour of the more tame two or three wood. Make no mistake, this pair pack are no shrinking violets themselves but they are more forgiving of a lack of technique and, therefore, more likely to deliver the required result i.e. a decent position down the fairway. Moving on to the four and five, these clubs come in to their own for long approach shots, but they also carry enough weight to handle shots from the rough, too. Woods are now manufactured up to an 11 for the simple reason that some players prefer to use them rather than irons, in part because they believe they offer a greater "feel" of the ball. However, the bottom line is whatever mixture of woods and irons you decide to arm yourself with, you're only allowed to carry a maximum of fourteen clubs including the putter. 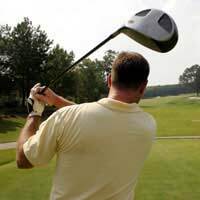 As with all aspects of the game, it's very much a case of trial and error, and over time the make-up of your golf bag may well change as you replace one or two of the irons with woods, or vice versa. But remember that before you head off to the club shop to splash out on a driver, be sure that you're up to handling it. Otherwise it will be red faces all round next time you are on the first tee. You have been warned.